Our Snohomish Washington customer came to us looking to put together a three car steel garage but was looking for something different in style. In going over a variety of garage designs that we have constructed over the years, what caught his eye wasn’t your typical steel garage but a shape normally associated with pole barns. Monitor-styled buildings—often designed for horses—have become more frequently desired as a garage. Due to its stylish design and shape, our customer requested that their new garage be a monitor building. Dismissing the need for a second story loft as it only housed three cars, no upstairs was built. Instead plenty of windows were added, sixteen in all, to bring plenty of natural light to the garage. 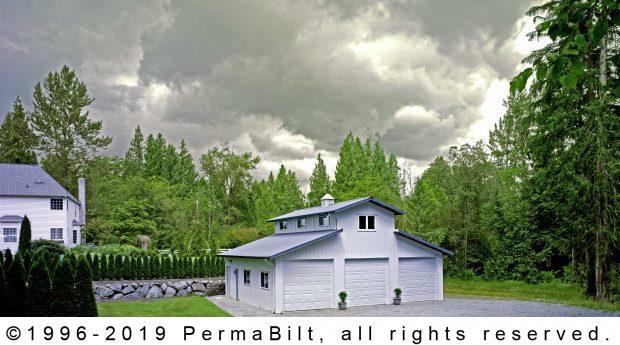 These custom made windows, pre-ordered by the customer, were installed by the PermaBilt® construction crew. And continued ventilation, beyond just opening a window, a cupola with horse weathervane was installed for both functio nality and artistic touch. Colors chosen for the building matched their house colors. All in all, our customer was very happy with the way their monitor garage turned out—one that is certainly unique to their neighborhood.